Client Q+A: Office Makeover with Smitten Films | Havenly's Blog! It’s an unfortunate truth that we spend a huge portion of our lives in the office. But, there’s no reason the office can’t be a place that’s just as lovely as your home. 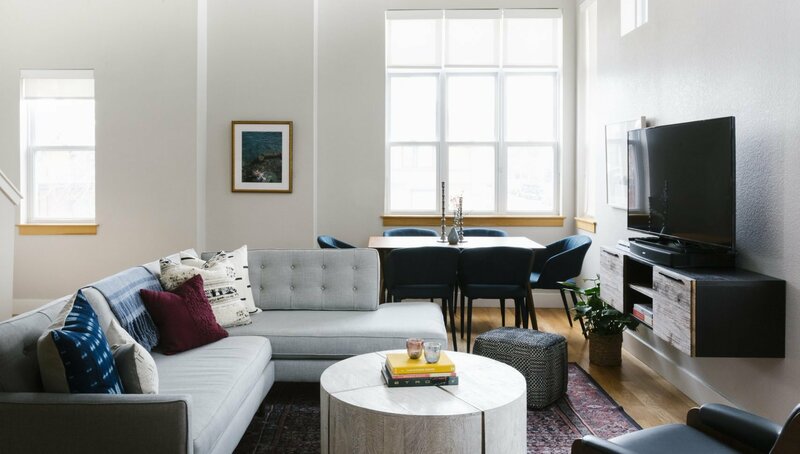 When Smitten Films approached us about redesigning their space, we were excited to help make the office feel a little bit more homey! With the help of a Havenly designer, Smitten Films took their small space from bland and generic to totally personalized. After seeing the awesome install time-lapse they made for us (it’s their specialty! ), we asked CEO and founder Lisa Ridd a few questions about the design experience and how small changes can make a big difference. Before: Cramped and generic. After: Stylish and fun! Havenly: Tell us a little about yourself! Lisa Ridd: I’m the founder and CEO of TriBeCa-based Smitten Films. We make custom family films for busy parents from their own media, making it easier for them to relive and enjoy their beautiful memories. (You can find us at @smittenfilms on Instagram). I’m also a mom of 3, so I love that I’ve been able to create a company that really is about making and enjoying memories with your family. H: Now, tell us about your office. What’s your history with the space? LR: We’re at the WeWork space in TriBeCa at 205 Hudson. It is a beautiful space and full of lots of interesting people and companies. The problem is, that while the common spaces are well-decorated, my office was not. I really needed a more inspiring space where my team and I could feel both motivated and comfortable. It was so fun to work with Havenly on this, and I also had a great time setting everything up with the help of my assistant and my 3 kids! H:Why did you decide to use a designer rather than do it yourself? LR: As an entrepreneur and a busy mama of 3 little ones, there are just never enough hours in the day to do everything I want to do. So pulling together a cohesive and beautiful plan for my office was just not something that I have time for. Plus, the small size and glass walls of the office presented distinct challenges. I really needed a professional to save me time and come up with smart solutions. H: What did you love about the space before? What needed to change about the space? LR: I loved the bright light and collaborative environment. I really needed more storage and just a more pleasant, personalized space to work in. Also, I wanted a space that would be more “Instagrammable” as we sometimes post in-office pictures on our social media accounts. H: How did you envision the space before the process began? H: Tell us briefly about how your design process went. Did you go through a lot of revisions? H:How do you feel about the finished space? What is your favorite element in your new office? LR: I feel much more professional and even more relaxed in a way! I think all that clutter was really distracting me. Everything seems to function much more smoothly when everything is in its place. I love the storage console! It makes everything look more pulled together. And I love how it is styled on top. H: Has the new look changed the way you work in your office? LR: For sure. I think we are benefiting from the fresh energy that the new design has given us, and I’m much more comfortable bringing clients by to see the space. This before and after shows how powerful a few changes can be in a space!